Getting prepared to sell your home is no easy feat. There is a lot of planning and organizing that precedes having the “For Sale” sign up in your front yard. If you have been living in your home for sometime, there are most likely areas that need a little extra TLC. While you may have become accustomed to looking at the dated porch lights, these are factors that could potentially deter a buyer from considering your house. 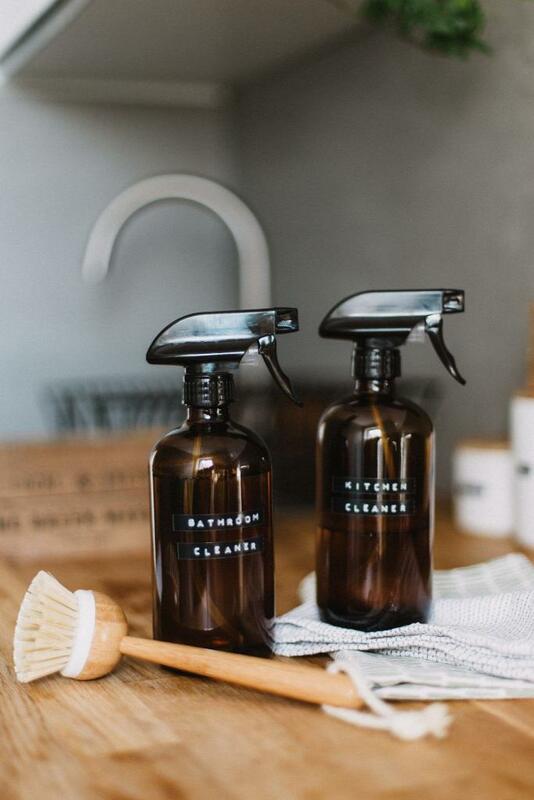 Spring is right around the corner, and most people typically have the urge to start spring cleaning. Rather than sprucing up the inside of your house, it may be time to beautify the outside of your home. The exterior condition of your home plays a big part in how fast your home sells. According to Zillow, the best time to sell your home in Florida is in the spring. Homes that were sold in the spring months sold 15 days earlier when compared to homes that were listed for sale in previous months. These simple yet budget friendly tips will add instant curb appeal to your home. guaranteed to attract a potential buyer’s eye. Whether you’re looking to sell your home or you just want to update the appearance these quick fixes will do the trick. One of the easiest things to do that will give you the highest payoff when selling your home is painting your front door. 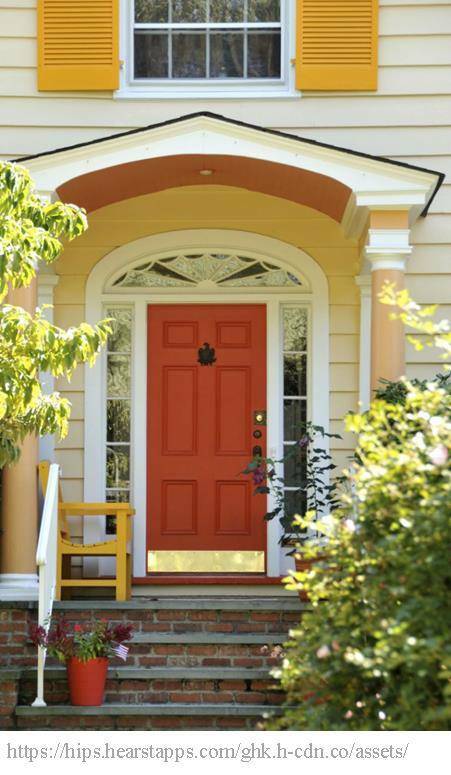 A brightly colored door is a fantastic way to draw attention to your house, to make it feel more modern and inviting. 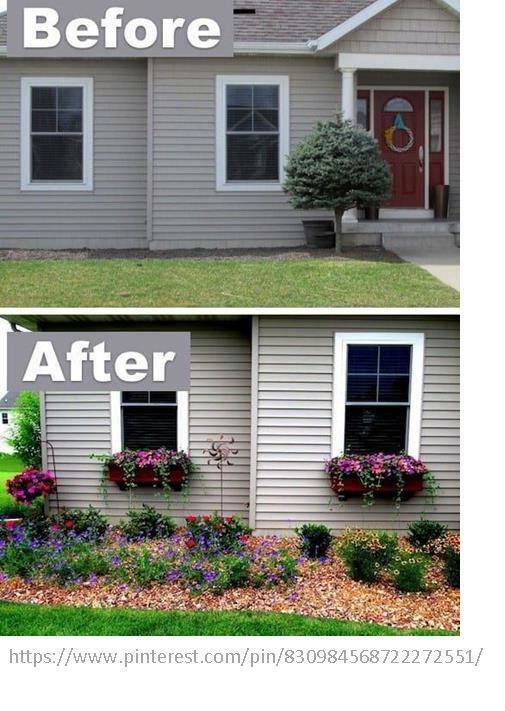 This simple update will make the biggest difference in the outer appearance of your home. The best way to pick a new door color is to bring swatches of the paint home and compare them to the exterior trim and brick coloring of your house. Wondering where to start when it comes to picking paint colors? There is an app that lets you see what different door colors would look like; it’s called Fresh Door Paint. Upgrading the door knocker and changing the handles on your entry door are quick and thrifty ways to enhance the appearance. Steer clear of the traditional contractor’s brass, as this is a sure fire way to date the character of the home. 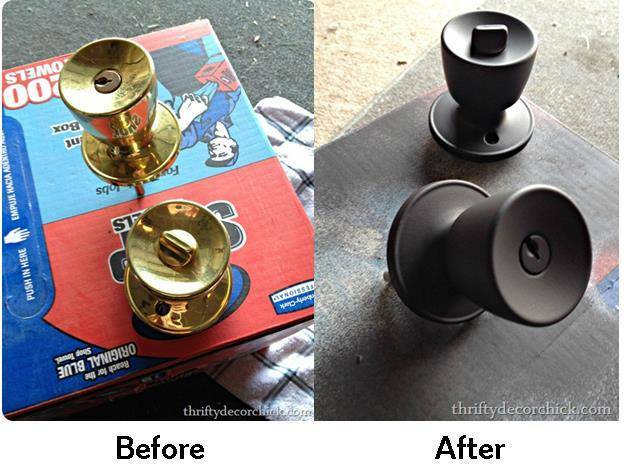 If changing out the handles sounds like too much of a hassle, spray painting them is an easy alternative to refresh the look. 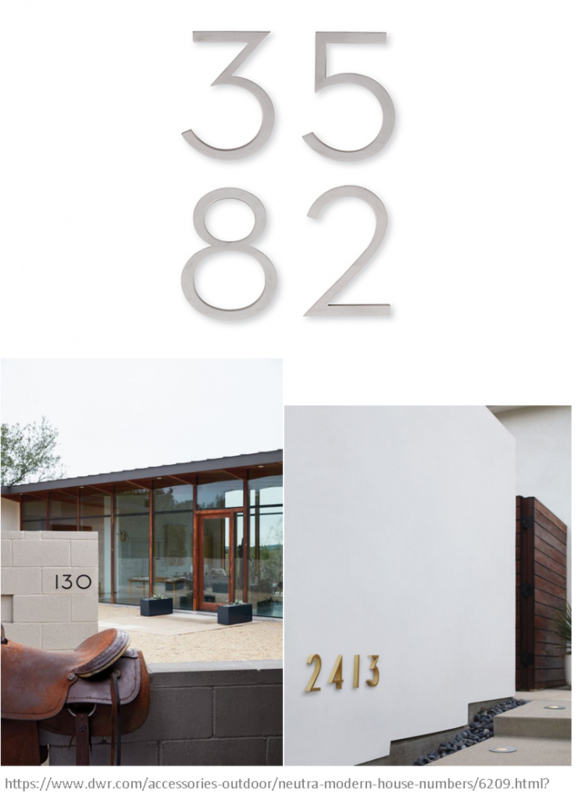 There are two different popular methods that are currently trending when it comes to updating your address numbers. The first is to obtain numbers with a trendy font, for example, fonts based on geometric letter-forms, as shown to the left. Alternatively, decals and stenciling are just as popular and are an easy DIY weekend project. 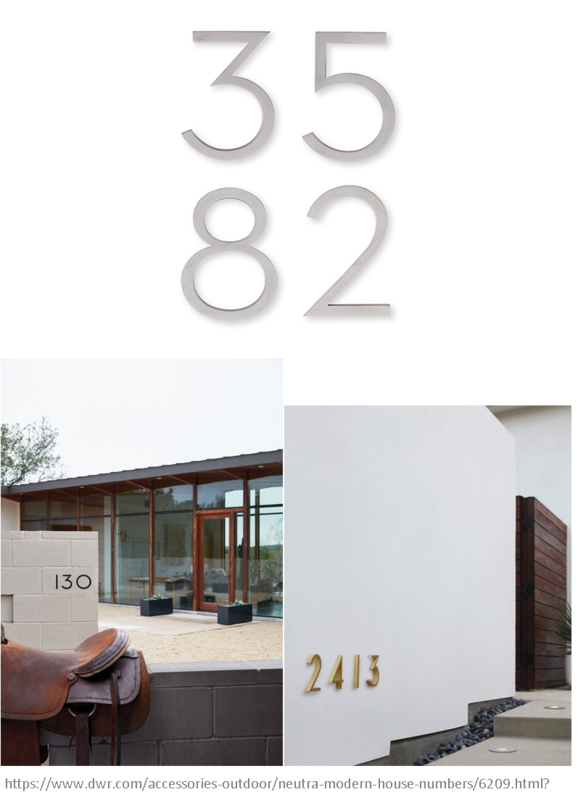 Design Within Reach has many choices of modern house numbers to pick from and purchase. 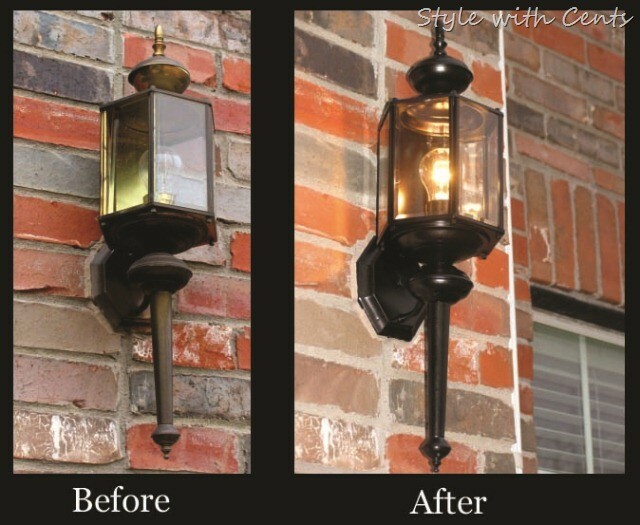 Porch lights serve as a safety feature at night, which is great for extra security. They can and should also be used to make a statement. If your lights are lackluster, it might be time for an enhancement. Picking out funky lights can add character to the front of your house but also serve as a statement piece, especially when combined with updated hardware and a colorful front door. Keep in mind, if you are updating your hardware, it would be ideal to have the lights and hardware similar in theme and color. It can be very expensive to totally redo landscaping for the front yard. Instead, adding w indow boxes is a classic way to boost your curb appeal. Additionally, they will deliver the pop of color that the front of your house just may need. There are many tutorials that will teach you how to create your own window boxes. Take a look at Pepine’s Pinterest board for some inspiration. Then it’s time for some fun! Adding the flowers and hanging the boxes are the best part! These upgrades may seem small and insignificant, but remember, attention is in the details. By changing these small items your home will appear newer and more up to date. All of these modernized upgrades will surely help to sell your home more quickly. The millennial generation currently makes up about 56% of home buyers on the market now, according to Zillow’s 2016 report of consumers housing trends. The Millennial generation has a large presence in Gainesville, due to the University of Florida. Millennial’s tend to be an extremely visual group that heavily relies on photos and apps to answer any questions they may have. 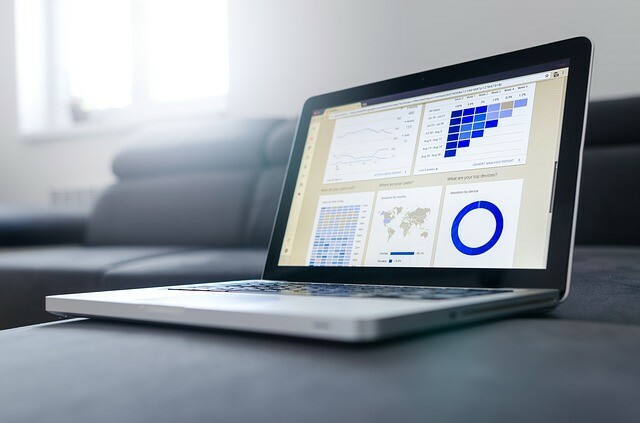 If you are interested in selling your house, these five updates will definitely catch the eye of a buyer and allow the presentation of your home to be visually appealing online. In turn, this will allow your home to sell faster. When the time comes to put your house up for sale, you know you can count on the agents at Pepine Realty. For more information contact us or call us at (352) 226-8474. This entry was posted in blog on February 25, 2019 by Katie Belton. February 18, 2019 – Announcing the selection of Betsy Pepine among America’s Top 100 Real Estate Agents® for 2019. Selection to America’s Top 100 Real Estate Agents® is by invitation only and is reserved to identify the nation’s most esteemed and skilled Real Estate Agents and Brokers with a history of routinely selling homes above market value. 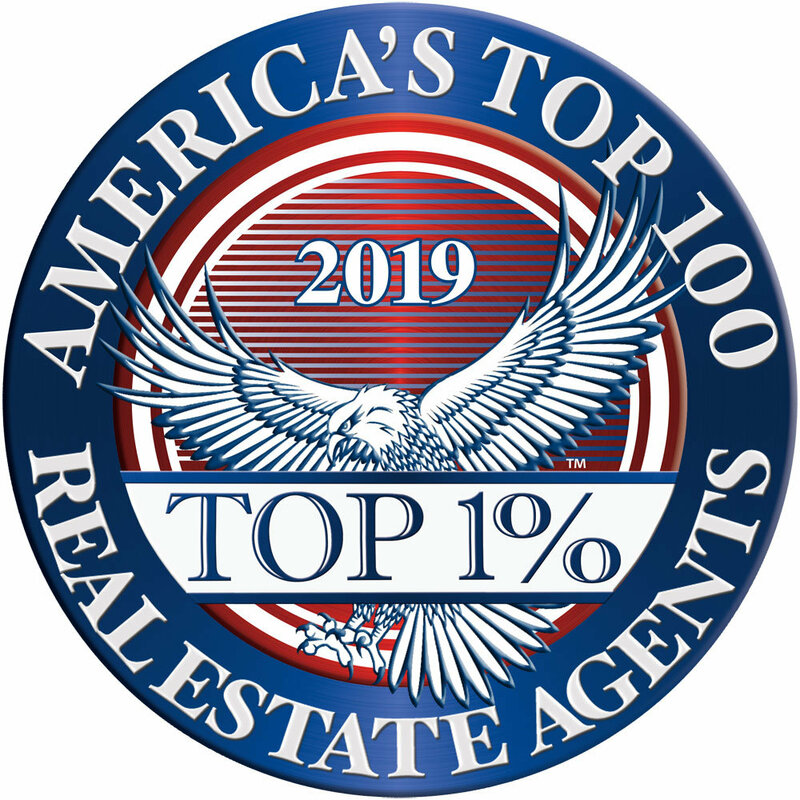 If you would like more information about America’s Top 100 Real Estate Agents® or the selection process, please visit our website at www.Top100RealEstateAgents.com or contact Kevin Wieser – Membership Director at Membership@Top100RealEstateAgents.com. This entry was posted in blog on February 18, 2019 by Katie Belton. Florida weather can make owning outdoor plants difficult. During the summer, sweltering temperatures can suffocate plants, and in the winter, sudden frosty temperatures can be detrimental to your plants. If you’re looking to maintain a garden or purchase a few plants to enhance your curb appeal, the ones on this list have been selected with care. They can withstand drought and frigid temperatures, and best of all, they’re low maintenance in the North Florida climate. Many of these plants, flowers, and small shrubs were found in the Florida-Friendly Landscaping Plant Guide. This flower, native to South Africa, resembles a brightly colored bird. Its height usually reaches from 4 to 5 feet tall with a 2- or 3-foot spread. They should flower several times during the year. They require full sun but can tolerate light shading accompanied by warmth. 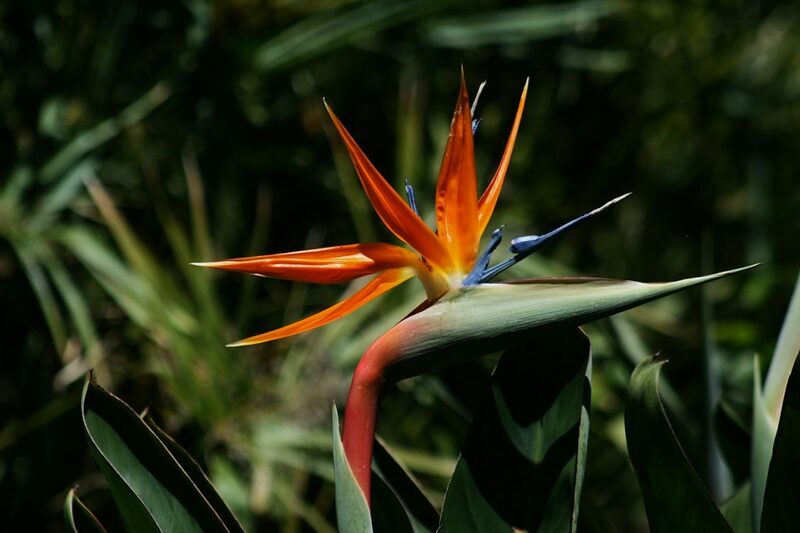 The bird of paradise can be grown near the ocean as they’ll endure the breeze. Overwatering can be detrimental to this plant and cause yellowing. We recommend you grow the plant in a container and take it inside when temperatures start to drop below 50 degrees. 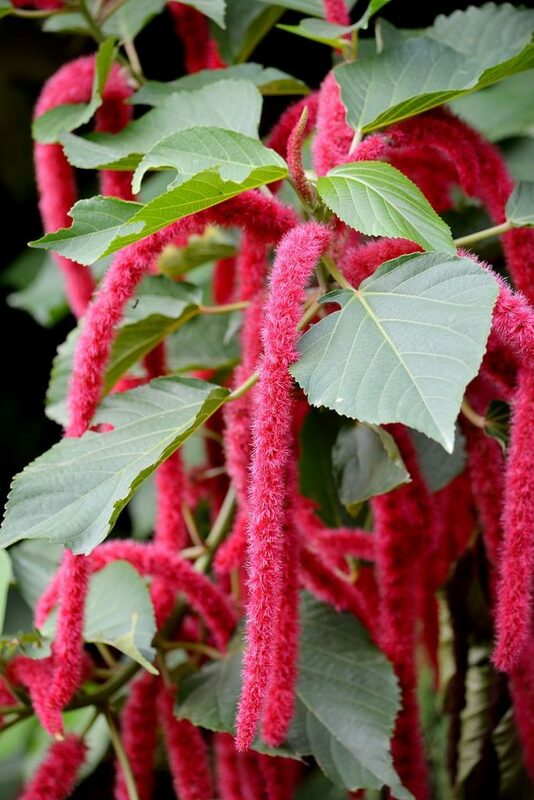 Chenille is French for caterpillar which is what the fuzzy red flowers on this plant resemble. In containers, the Chenille Plant will top out at two to three feet, but planted outside, they can grow between eight to fifteen feet tall. Chenille plants are tropical and prefer part sun to part shade. They will blossom all year. Unlike the Birds of Paradise, the Chenille Plant does not do well in windy environments. We recommend you keep them potted and bring them inside when weather gets chilly as they will sag in temperatures below 60 degrees. The cast iron plant is a tough hardy plant that thrives in shady spots. It can be grown outdoors throughout Florida. Avoid putting it in direct sunlight though. The leaves of this plant will reach between 12 to 20 inches tall, and slowly, the plant will spread across the habitat. After they are rooted, you will not need to water these plants, however, they will perform better if watered periodically. The cast iron plant is low-maintenance and will add texture and exoticism to the shadier parts of your landscape. It will also do well as an office or house plant. 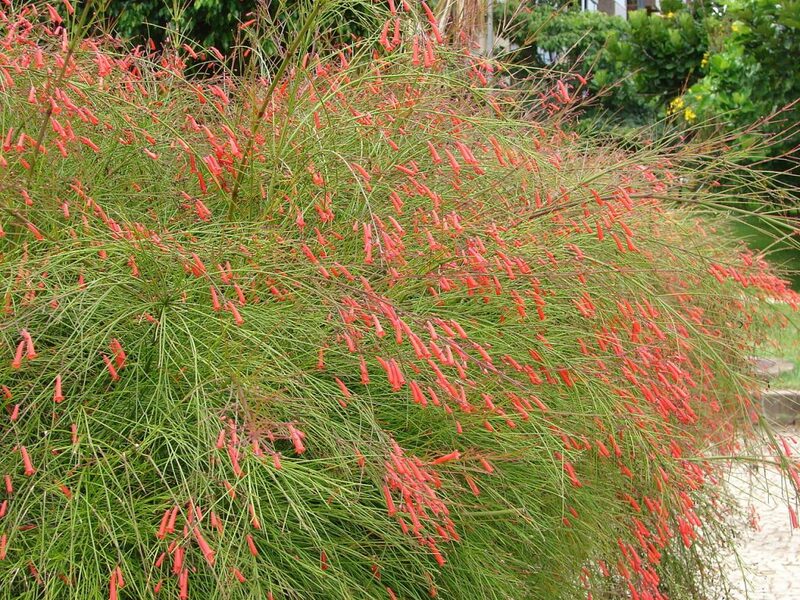 The firecracker plant is a great option for individuals seeking to add a pop of color to their yard. 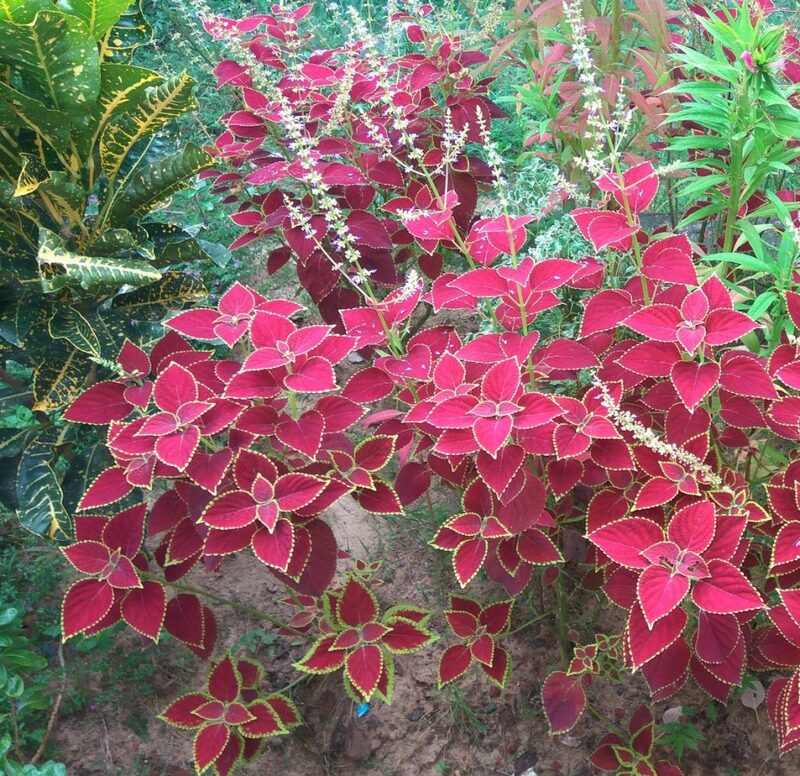 With showy red flowers, this plant will expand quickly across your Florida landscape. The plant grows up to three feet tall and will spread up to five feet wide. The plant prefers regular moisture but can tolerate dry spells as well. You should cover the plant in colder weather or bring it inside. It attracts hummingbirds and butterflies. While the coleus does not flower, the foliage comes in a variety of colors, patterns, and leaf shapes that add variety to your garden or landscape. Additionally, these versatile plants can be grown in sun, shade, or partial shade depending on the variant you choose. The plant may flower, but if it does, to maintain plant form, nipping the bud is recommended. To add more interest to your garden, you can plant several coleus varieties together which will make them pop. Add them to beds or borders for interest or put them in baskets and containers to limit their growth. When the weather gets chilly, cover the plants or bring them inside. They will thrive in the warmer months. 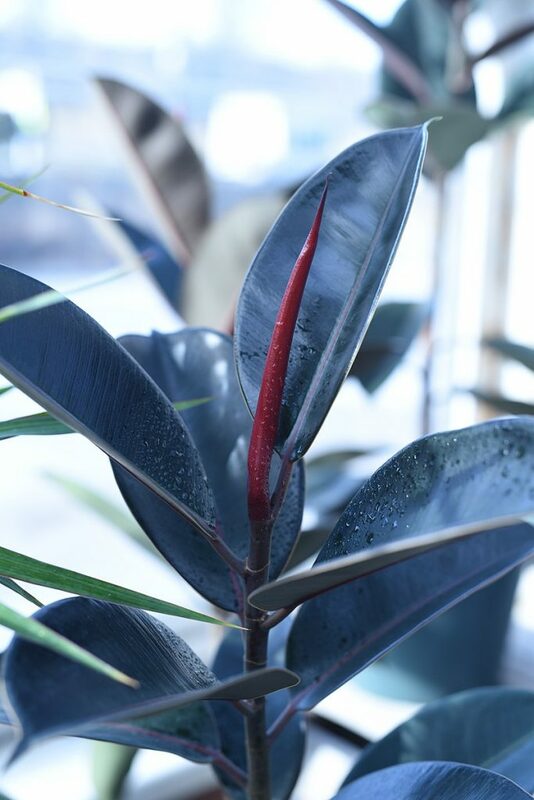 While the rubber plant is typically grown and cared for indoors, it can also thrive outdoors in North Florida as a tree, requiring only protection from wind, covering from frost, and a shady environment. The plant, named after its rubbery looking leaves, might require pruning as, in the wild, the tree can grow between 40 and 100 feet in height. The plant may require watering during the summer which is the growing season for rubber plants but should require little maintenance. Because of their size, they can be used as space dividers or privacy screening on patios and decks. While there are more than 1,300 species and hybrids of begonias, wax begonias are one of the few that do well as landscape plants. They come in various shades of red, pink, and white and do well in sun or shade. 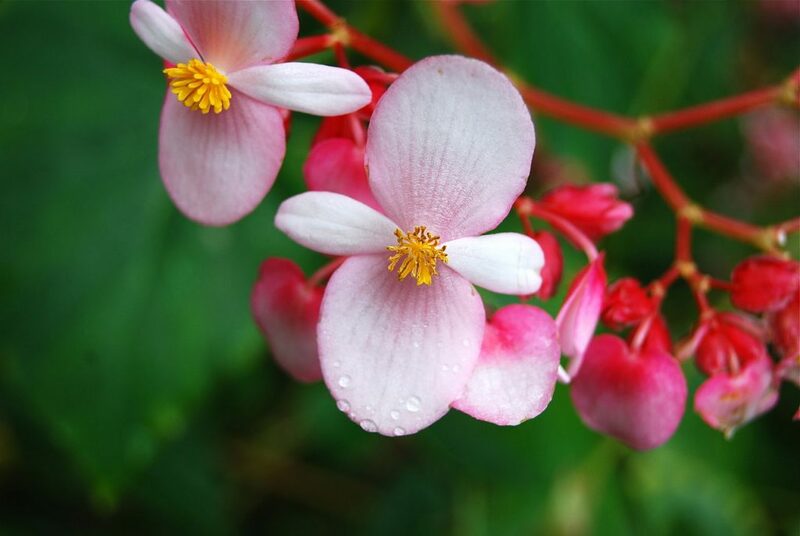 Begonias can grow anywhere from 6 to 18 inches tall and spread 6 to 12 inches. Unlike the impatiens, begonias should be deadheaded. Like most other flowers, they do not respond well to cold and should be planted after a frost. 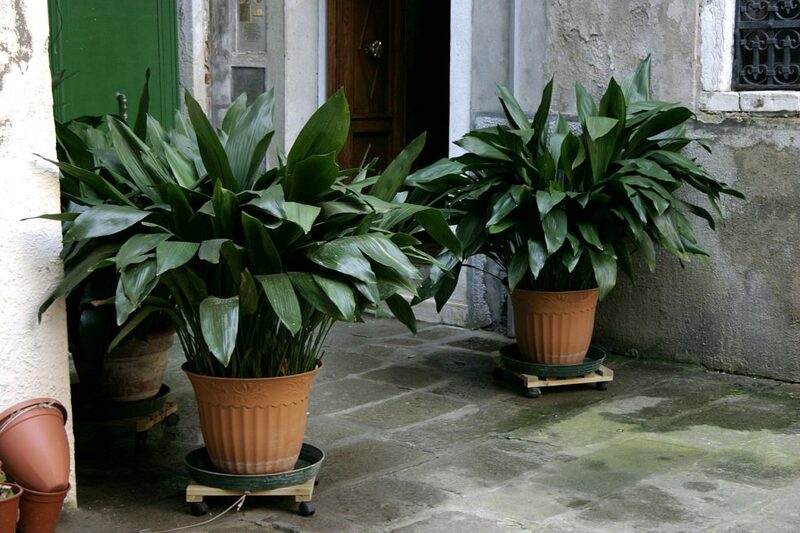 They can be taken inside and used as houseplants during the winter or just brought in during frosty weather. Used in landscapes as a border or edging plant, begonias can help your garden pop. 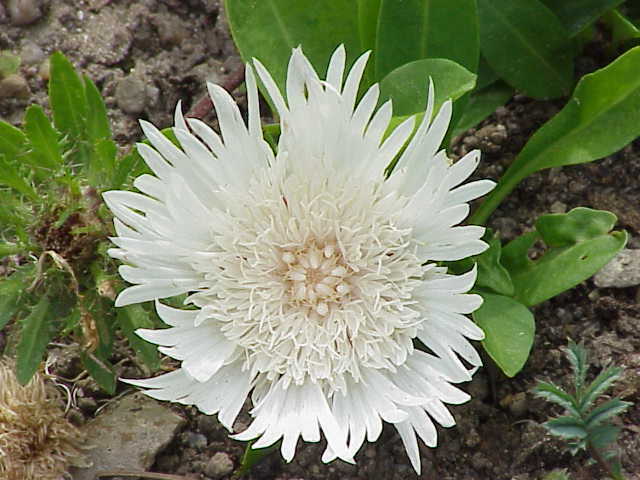 Stokesia is a plant native to Florida wetlands that grows beautiful flowers in white, blue, purple, and lavender. They grow well in full sun or partial sun and are hardy plants that don’t require consistent watering. These plants are known as one of the best perennials for Florida. They grow up to 2 feet in height and 1 and a half feet across. Wet soil can be detrimental to this plant leading to rot, but unlike most other plants on this list, stokesia will do well in frosty winters. They should be deadheaded but offer bounteous beautiful flowers from midsummer to early fall. 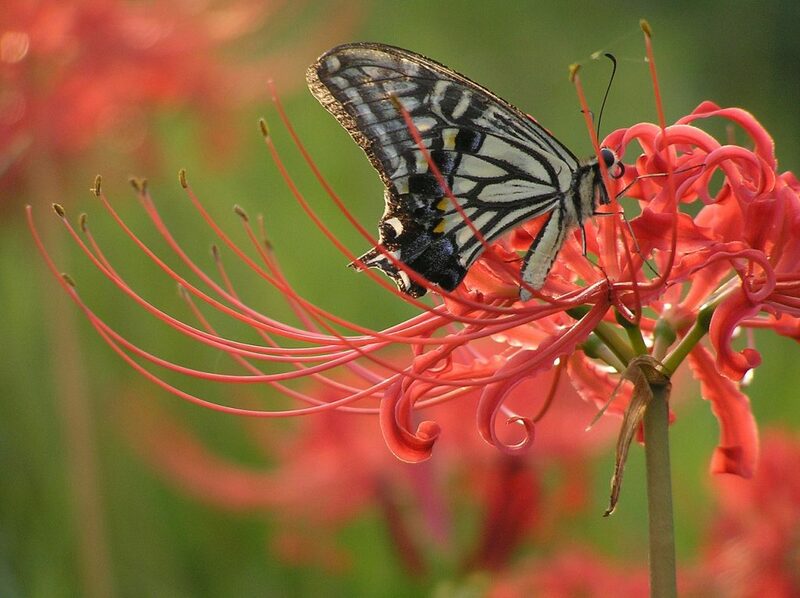 Spider lilies are a hardy flowering plant that grows well in the heat and cold making it the perfect North Florida plant. They prefer full sun to part shade. Their blooming time is August to September which is more unique giving your garden a nice flowering plant as fall approaches. The plant grows between one and two feet tall. The red flowers look spider-like on lush green stems, brightening and adding interest to your garden. Additionally it is fragrant giving your garden beautiful color and pleasing aromas. Most attractive about this plant, though, is that it does not need protection from the cold or heat. After their blooming time, they’ll grow leaves and resemble shrubs. When summer approaches, they lose their leaves for a few weeks before flowering again in a constant cycle. Impatiens plants are typically seen as décor in most summer gardens or front lawns. They thrive in warm weather and offer a pop of color that brighten up your home’s exterior. They will grow between 6 and 30 inches tall and are sensitive to lack of water. Additionally, while they can be grown in direct sun, they prefer partial to full shade. The plants typically do best in warmer weather and should be planted after the dangers of frost have passed. When planted close together, the impatiens will grow to form a bank. 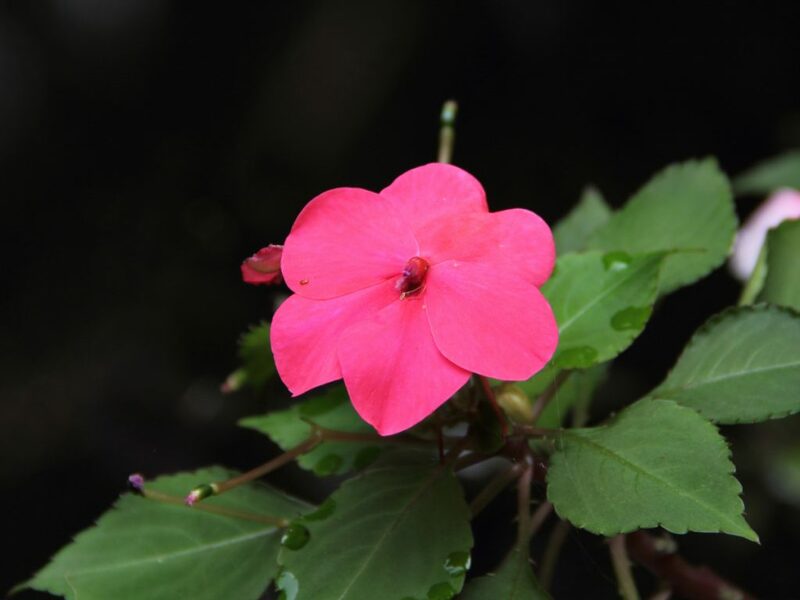 Unlike other flowering plants, impatiens do not need to be pruned or deadheaded. They should bloom all season long. Growing plants outdoors in an unpredictable environment may be difficult but do-able. Unlike further north, you don’t need to say good-bye to your plants in the winter if you give them the right care and do your research and what plants work best. We hope this list helps you find a few plants that will increase your property value and curb appeal. 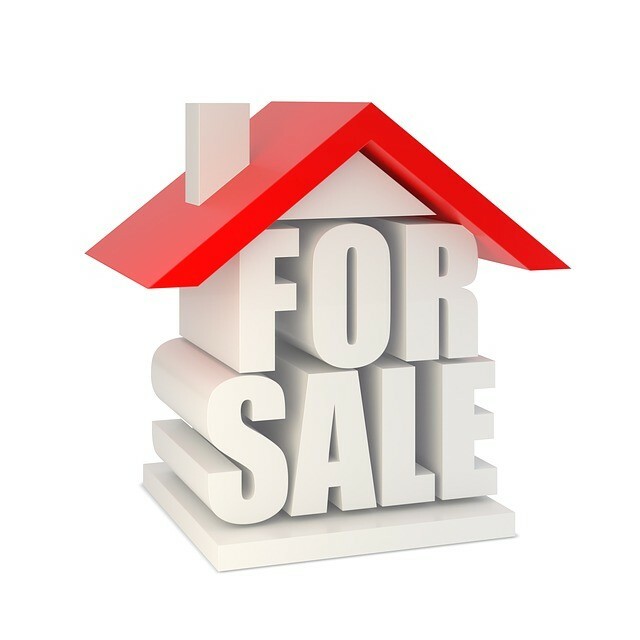 When the time comes to sell your house, know you can count on us. Contact us for more information as we would love to help you find your dream house or property. For more information call our office at 352-226-8474. This entry was posted in blog on January 18, 2019 by Katie Belton.